Legion Athletics produces some of the highest quality supplements on the market. Menari Body Works does NOT receive a commission for promoting their products, we have just used them personally and know that they do work! Here are some of the supplements that we have tried and loved! We hope you do too! 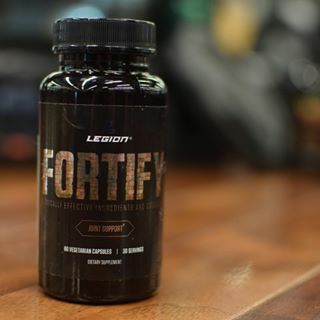 Fortify is one of the supplements that we recommend from a company called Legion Athletics. What we really like about Legion is that all of their products are natural, plant derived, extensively researched and backed by science with no fillers or un-necessary ingredients. Just the good stuff, clean and simple! Fortify has a clinical dose of each of the following to help reduce inflammation and prevent the immune system from "attacking" proteins found in joint cartilage: Curcumin (active anti-inflammatory ingredient found in Turmeric) Grape seed extract, Acetly-11-keto-beta-boswellic acid, Black pepper fruit extract, UC-11 Undenaturted Type 2 collagen. If you are suffering from injury related inflammation, arthritis, rheumatoid arthritis or just plain achy stiff joints Fortify can help! This is no ordinary multivitamin. Legion has created this "sport multivitamin" specifically for athletes and the fitness enthusiast in mind. It has been formulated in order to fill the holes in your diet that are hard to get from food sources alone. 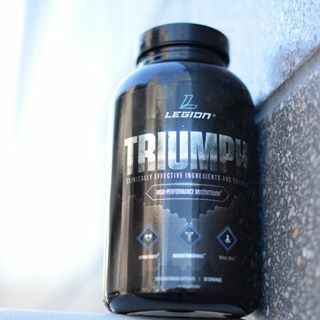 Triumph was created to help improve performance in resistance and endurance training, heart health, blood flow, cholesterol profile, insulin sensitivity, memory, cognition, immune function and more! Legion did their homework, and researched which vitamins can deliver these benefits and included them at clinically effective doses in Triumph without any fillers or other bogus ingredients . Check it out! Whey + is Legion's protein powder, and it is DELICIOUS! There are so many protein powders out there that taste chalky and you have to force yourself to choke them down. This is not the case with Whey +! Besides being super tasty Legion has again delivered an extremely high quality product made with top ingredients. Whey + is free of lactose, artificial sweeteners and fillers, gluten, MSG, and GMO's, They use milk from Ireland, where the dairy restrictions are much heavier therefore delivering a higher quality product. The cows are grass fed, and not treated with hormones. 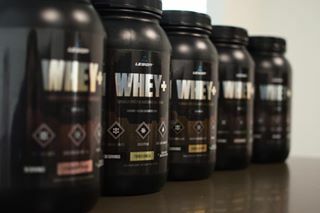 Whey + is 100% whey protein isolate delivering 22 grams of protein, 1 gram of carbs, and 0 grams of fat per serving. Vanilla and Cookies and Cream are our favorites! Jump over to the Legion site to see why you might want to start adding more protein into your diet. Why take a pre-workout supplement? Why not just have a big ole' coffee? Well, coffee is great to get you moving, but it also has a wicked crash to it leaving you feeling like you need more just to make it through the rest of the day. Besides that, it isn't going to do much else for you. Here is the skinny on pre-workout: wouldn't you like to have more endurance? More speed? Better workouts without crashes, upset stomach or jitters? So did Legion, so they made Pulse to fit those needs. Pulse has clinically effective ingredients that have been shown through studies to boost energy levels, enhance performance, improve mood without crashes, jitters and feeling like you are going to have your heart jump out of your body. Pulse contains 350mg of caffeine (same as 2 large brewed coffee); L- thaine to increase blood flow, alertness, memory; citruline malate to improve endurance, relieve muscle sorenss, improve aerobic performance; betaine to increase strength; and l-ornithine to reduce fatigue. Beta- Alanine is probably the most interesting ingredient in Pulse in that not only can you feel it working via tingles in the face/hands/arms but also in what it does. Beta-Alanine is an amino acid that when increased on a cellular level causes an rise in carnosine levels which counteract muscle acidity (which is a biproduct of contraction) thereby increaseing the amount of work the muscle can do before it fatigues. All in all, you might notice a difference in your performance if you try Pulse instead of coffee before workouts.